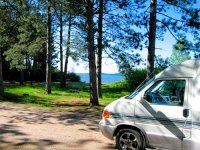 The Friends of the Apostle Islands National Lakeshore Park is a group of volunteers who raise funds and support the maintenance of the park and its recreational facilities. Among the current projects are purchasing beer-proof storage boxes, construction of two benches on Stockton Island, assisting with the refurbishing of the Manitou Fish Camp, and a supporting a research project on the mainland sea caves. Go Here to learn more about the Friends and their projects. 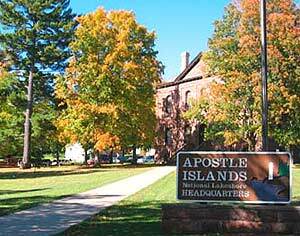 The old county courthouse in Bayfield houses the main Apostle Island National Lakeshore Visitor Center. Here one can view audiovisual programs, exhibits, and obtain information on touring and recreational opportunities. 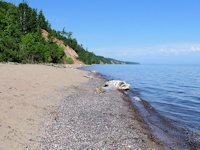 Popular Bayfield Events & Visitor Attractions. 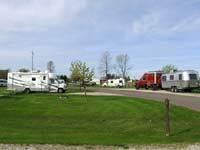 Campground Listings - Bayfield Area. Bayfield & Ashland Fall Color Scenic Drives. 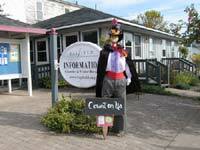 The Bayfield Chamber & Visitors Bureau office is conveniently located downtown on Manypenny Avenue. 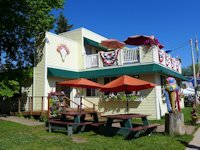 They are the prime sponsor of AppleFest and are an essential stop for the Bayfield visitor to get useful advice, maps, brochures, and information on enjoying the Bayfield area. 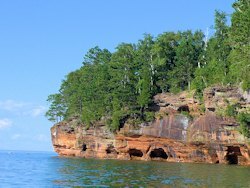 Apostle Islands National Park Cruises.